This is great "comfort food", very kid friendly and a perfect way to use up extra veggies, potato, or whatever you have in the fridge. Much easier than the long, wordy directions make it sound. And seriously, isn't ANYTHING wrapped in puff-pastry going to be yummy? Thaw the pastry sheets at room temperature 30 min. Saute brocolli, onion and mushrooms in oil until onion is translucent. Add "chicken" and cook 5 min. longer. Make the "gravy": Bring broth and soymilk carefully to a boil. Dissolve cornstarch in a small amount of cold water and add to broth, stirring carefully until thickened. Remove from heat. Season to taste with salt, pepper, sage and onion powder. Mix gravy into vegetables and "chicken" gradually, only until it's very moist, but not "soupy" - you may not use all the gravy. Grease muffin cups well. Unfold pastry on lightly floured surface. Roll each sheet into 12" square and cut each 9 squares. Stick a square into a muffin cup and push down - quite a bit should stick up over the edge. Put a small spoonful of vegetable-chicken-gravy filling in (only fill the cup about half). Dab a bit of soymilk on the edges. Bundle up the edges (you may have to gently stretch the dough a bit) and seal them all together in a messy blob-like-thing. Bake for 20 min. or until golden brown. Remove, let set 5 min. or so, and carefully remove "blobs" from muffin pan by sliding a knife blade around edges. The filling will be HOT and they do tend to stick to the pan. Blobs! How darn cute. Most of my attempts to be fancy end up very blob like in shape. Of course I eat it anyways but calling it as it is always inspires! Thanks for the recipe and encouragement to keep myself honest. i like the name "happy accidents". good idea, i'll have to put these together soon--sounds like a nice wintery comfort food! These sound so good! I can't wait to try them, thanks for all the great recipes! Hey, I had veggie pockets on the menu for this weekend. I hope they turn out looking half as good as your blobs. The really do look good. Cute! 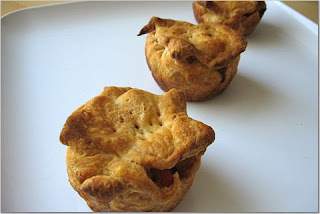 I love the idea of bite-sized chicken pot pies! And you're right about puff pastry. I could wrap my dog's poop in a puff pastry and it'd probably taste good. Chicken pie blobs! I love that name - forget bundles! There's nothing wrong about a blob as long as it's wrapped in puff pastry! They look so crunchy good! Blobs! I love it! Guess I need to go get me some puff pastry! i might try this but use some tofu instead of the "chicken" strips. how cute! Yummy! We are going to have to try this. I bet the kiddos will love it.